As a certified Google Partner agency for over 7 years, we get many questions from first time AdWords Advertisers. One of the most common questions is "why should I pay for branded search terms?". This is an understandable concern since every marketing dollar needs to count, and the thought of Adwords cannibalizing natural, no-cost clicks could initially seem like a bad idea to a paid search newbie. Even if a user doesn't click on a paid ad, there's a good chance that seeing it will influence them to click on the organic listing. Low CPA's are one of the main reasons people hire us: to produce more for less. Visitors who are searching with your brand name are closer to the point of converting than those using broader searches. Sure they "might" find you in the organic SERP's, but why would you take the risk of losing out on any of these important searches? These are the visitors you need to seek aggressively. Let me say it once more - Bidding on brand keywords will decrease your overall cost-per-acquisition. Studies show that companies who show up in the #1 spot in both sponsored listings and organic results have increased credibility & top-of-mind awareness to their audience. 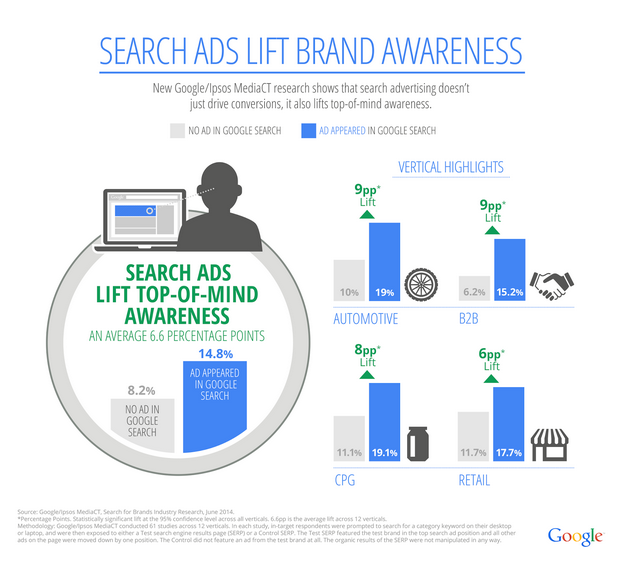 Paid search and organic listings work together to lift your brand awareness. Test this yourself by measuring brand query growth over time. In the same way Organic search results and sponsored ads work together to improve brand awareness, they also assist each other in driving clicks. That's right, even if a user doesn't click on a paid ad, there's a good chance that seeing it will influence them to click on the organic listing. Google even did their own research on this. There's no denying that the more online real estate your brand can take up, the better. This is even more true when it comes to mobile searches, where only one result could be listed at the top at a time. Savvy competitors are most likely already bidding on your brand name, showing above your organic listing. It's nearly impossible to show up at the top of the page for your brand searches 100% of the time through organic listings alone, unless you somehow have zero competition. Think about it - when you search specifically for something including the brand name e.g. "The Northface Shoes", you just assume that you'll see a sponsored ad from them, because they are a market leader. However, if instead you saw an ad for Amazon, or Sportchek, or Ebay first, all selling The Northface Shoes with a tailored ad with "free shipping", there's a good chance you'd click on that instead of scrolling down to the organic brand listing. Service based companies also often bid on their competitors company names. Why would anyone ever want to risk losing inexpensive, high quality clicks, from people looking directly for their business? Pro Tip - The average CPC (cost-per-click) is very inexpensive when you are bidding on your own brand. Brand terms are extremely relevant, and are the easiest way to raise your CTR% (click-through-rate). CTR% is the biggest factor in determining the Quality Score of your account. The higher your Quality Score, the better ad positions you can get and the lower your CPC will be. Are you starting to see what we mean by low hanging fruit? Gain control over the first thing the searcher sees at the top of the SERP's. Dynamic, custom messaging simply isn't possible organically. Bidding on your brand name allows you to ensure your brilliantly written messaging, with all of your glorious ad extensions will show in the coveted top of fold content when a user searches. Studies show that companies who show up in the #1 spot in both sponsored listings and organic results have increased credibility & top-of-mind awareness to their audience. Running a promotion? Have specific, current content you want your customers to see? Do you have a dedicated sales / conversion page you'd love to send your visitors directly to? You are in complete control over the site destination your visitors will land on. Getting people to what they are looking for faster improves the visitor experience, and increases sales/leads/conversions. That's the short and sweet of it. 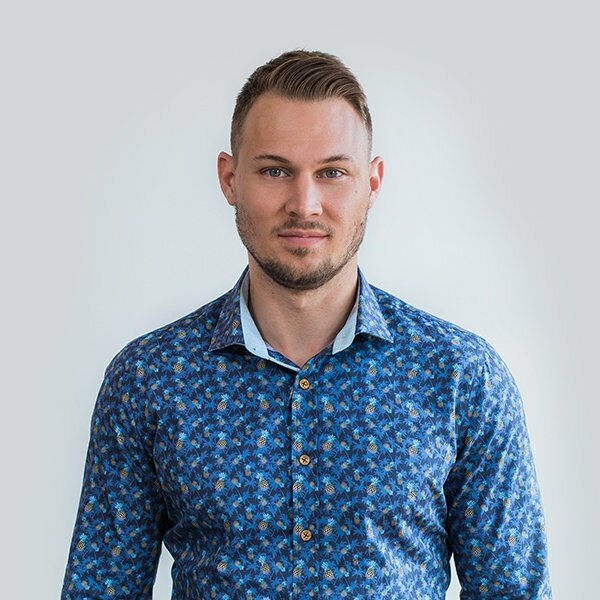 Of course there are some occasional situations where it may not make sense to bid on your brand keywords, but 95% of the time this is something we strongly recommend as part of a SEM strategy. We hope this has given you some exciting new items to discuss with your account manager. 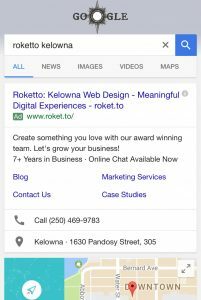 If you're looking to achieve real results from your online marketing, contact our Kelowna AdWords agency!